Love the classic Skillet Cinnamon Apples you get at Cracker Barrel? Now you can make them at home and in less than 30 minutes time! Despite Christmas around the corner we are still in the heart of apple season and I couldn’t be more excited! 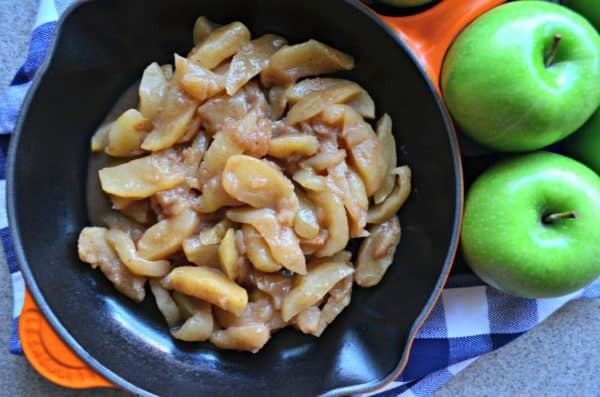 I love to indulge in the fruit of the season whether its in the pie form, cut raw and dipped with peanut butter, or accompanied with a main dish. I’m also 7-ish month’s pregnant and craving ALL THE APPLES! I’ve been to Cracker Barrel a few times during this pregnancy just to get the coveted cinnamon apples. And then I had an epiphany one day at home and decided to make them. Big mistake… because I found myself making them 1-2 times a week. I can honestly say this recipe has been tested well over a dozen (ok, maybe two dozen) times. I’ve tested multiple different methods and found that cooking them in a skillet was best. I also found that using a corn starch slurry over an all-purpose flour slurry yielded a thicker more pure syrup. A touch of butter helps the sauce come together. I’ve tried both apple juice and apple cider. They both yield the same taste. So no differences there. I also tested using cinnamon and nutmeg verse apple pie spice, and at the end of the day I liked the spice mixture (and simplicity of measuring once) from the apple pie spice. 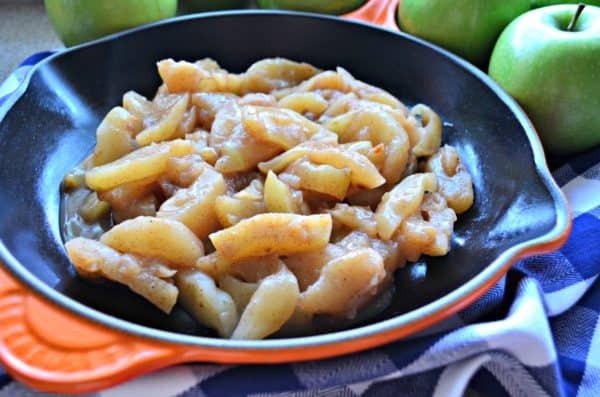 One thing you need to realize when you make the skillet cinnamon apples is that you aren’t cooking the apples to mush. You are cooking them just until soft but not mush. I bring them up to a boil and then simmer and have found that method to be best, but this is definitely a recipe that you need to watch. You can’t leave it and go off and do something else. Trust me, I’ve ruined a few batches. I mean, don’t get me wrong it made for great apple sauce, but that is not what it was intended to be! 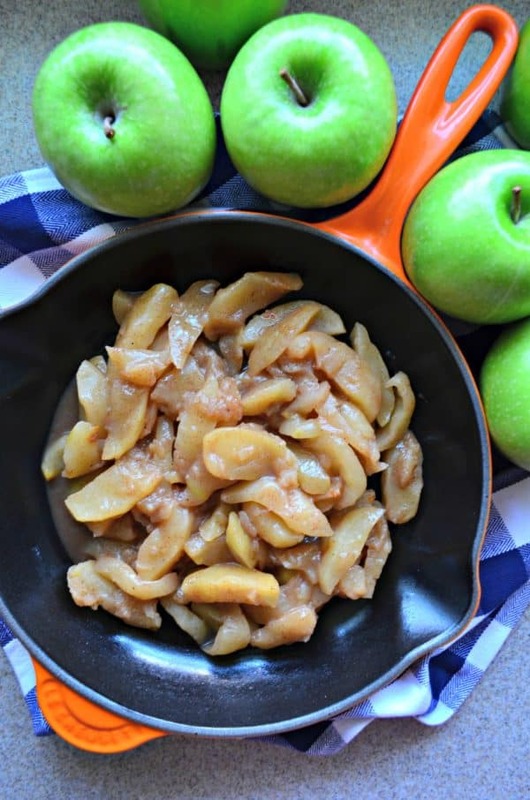 I mainly eat the skillet cinnamon apples as a dessert, however, they pair great with a nice pork loin or pork chops. 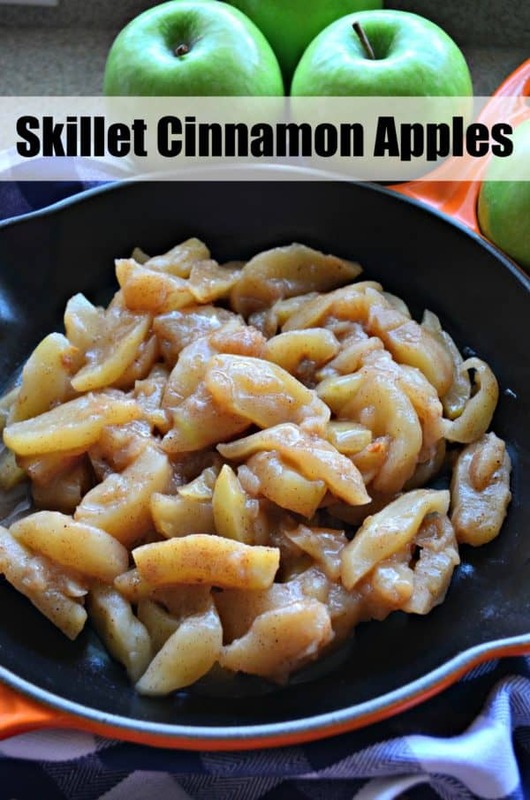 So if you have the same craving as me, or simply want to try your hand at making skillet cinnamon apples, just know it’s an easy recipe to make in 30 minutes or less!